Matt Smith founded christian progressive power metal band Theocracy in Athens, Georgia in 2002, originally as a one-man project with Smith playing and singing all the parts, but it is now a full quintet. Their last album, As the World Bleeds (2011), included some of my favorite ever recordings by the band, including I Am, Nailed and 30 Pieces of Silver. But that was then. “One more rally cause and off we go. “Messenger of ages, carried on the wings of second birth. Unto the silent secrets of the earth. “There’s a place for you here. Raise the anchor, all aboard, as the Captain calls His misfits. Later Smith implores “Come aboard and leave your darkness behind” as a chorus sings “There is revolution in the air” behind him, guitars and drums helping to beat out this anthem for the ages. “All our knowledge and our plans, every circumstance of man. “Giving to receive, you’ll be exalted through humility. True freedom found through slavery. “One waits for a rainy day, while there are stories left to tell. One more chose to look away, a penny for the wishing well. Blood in the water, the saint and the martyr will stay. “From vision to action, there’s a new story to tell. Around the World and Back opens with bells and innocent children’s music. Smith sings “Hey weary traveller, have you finally lost you way?” a capella, a unique opportunity to hear his voice without the powerful instrumentation behind him. It’s the lyrics…the story they tell, the ability to convey a message without forcing it. “Reaching out”…yes, that’s it. You grabbed the simple gift and held it as a child. You’ve been around the world and back. “A supernatural visitation of the highest order. Reanimation of the flame once blazing. “We march to the beat of a different drummer. Duty, decree, and a sense of wonder. Enemies gathering on all sides. A single voice echoing deep inside. “Destitution, all the others have gone. Left you there all alone. Don’t be afraid, this world is not your home. Disillusioned, just a pilgrim passing through. Disdained in everything you do. But there’s a single light that’s shining through the dark. So fly the flag ‘til your ship comes in. 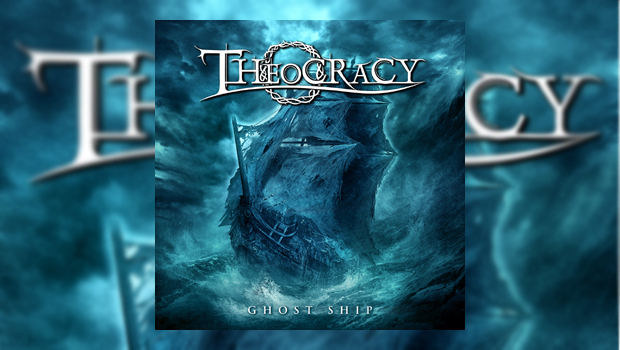 This is another excellent album by Theocracy, complete with fine musicianship throughout, but it is the lyrics which set this band apart. They are unafraid of declaring their faith and do so with power. If you are in search of metal music outside of the regular doom and gloom, this is your ticket. It is meant to inspire and provide witness to the multitudes of fans who also believe and are not afraid to do likewise. It is music that is fearless and driven by a sense of awareness of the moment… of the present disenchantment in the world and the fear for all that we have lost. The album points to what can still be discovered if all of the world’s material possessions and treasures still leave you lacking. Join the castaways on this Ghost Ship and sail the journey over troubled waters with others…like you.